Just off of beautiful South Beach in Katama on a private, wooded 1 and 1/3 acre property with a big beautiful yard, and across from a large nature preserve. 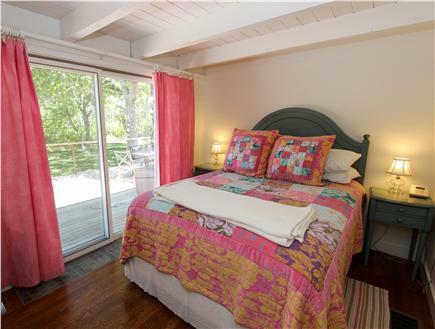 Recently renovated by a leading local designer, this lovely beach home includes first class furnishings chosen for a casual, but premium vacation experience so you can relax and enjoy. 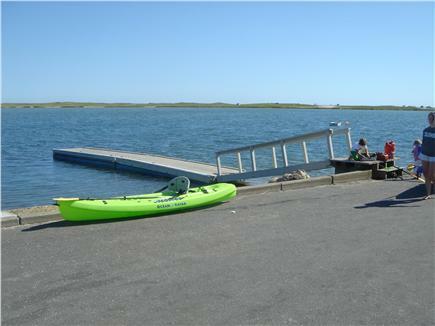 Located steps from the Katama Road bike path, and the Public Bus route, on Mattakesett Bay Road, only 1/2 mile from South Beach, 1/4 mile from Katama Bay and 3 miles from downtown Edgartown. This is the closest you can get to ''on the beach'' in Katama without paying mansion-like prices. 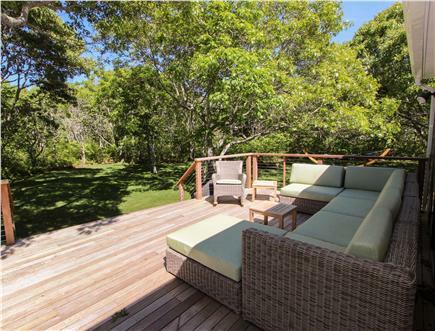 A long, wide deck extends the length of the back of the house for private sunning and entertaining. A Private Outdoor Shower with Separate Changing Area provides the quintessential beach experience, showering in the sunshine after a fun day at the beach! Inside, the open floor plan includes a brand new kitchen, dining area and sunny living room with fireplace, all in stunning great room with an airy cathedral ceiling. The house has central air conditioning. Living Room has full seating area plus TV, DVD, CD Player. The house is equipped with wireless internet. 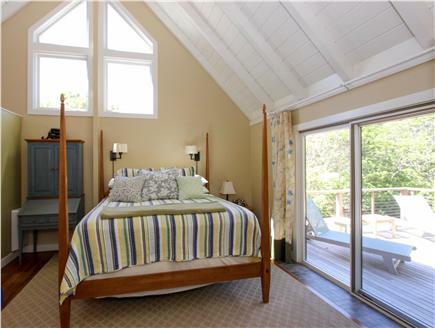 The large master bedroom with en suite bathroom has a soaring cathedral ceiling, and is decorated with a king size bed, antique armoir, dressing table, and writing desk. It comes complete with a large walk-in closet, and slding doors to deck and private sitting area with teak lounge chairs. 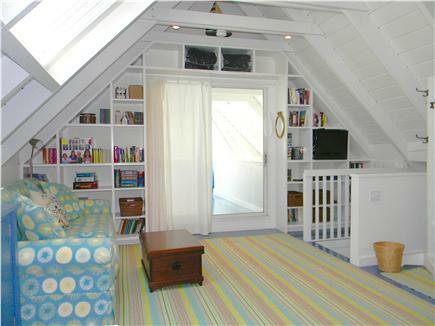 The second bedroom is charmingly decorated with a queen bed, contains a large closet, and sliding doors to the deck. It has easy access across the hall to the second full bathroom. 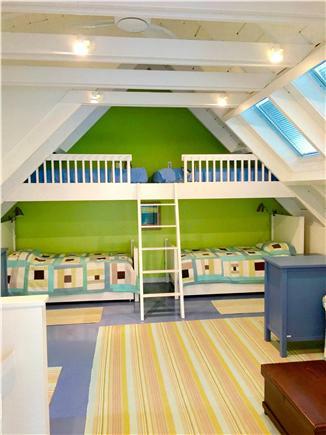 Upstairs is a huge, airy third bedroom with en suite bathroom, complete with cathedral ceiling, skylights and a sunny sitting area with TV/DVD/video game/entertainment center. Enjoy this third bedroom as a private suite for two adults in the twin beds or use the queen sized sofa bed for a larger group. 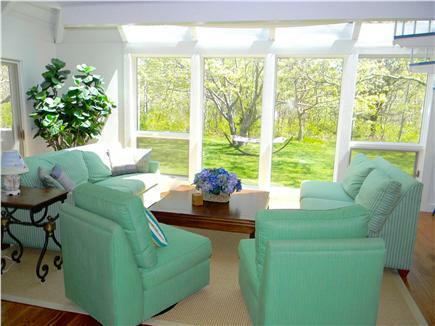 From this wonderful location, you can take full advantage of all Martha's Vineyard has to offer: miles of bike paths, exquisite beaches, boating, offroading, kayaking, running trails, fishing, nature preserves, shopping and historic sights and museums plus plenty of entertainment and fine dining. Additional pricing info: Additional fee of $150 for housekeeping charge will be added at lease signing, State and local taxes of 9.7% will apply. Four Steps up to enter house, then 2 bedrooms and 2 bathrooms are on first floor. We had a wonderful week- - sitting outside, playing games, and enjoying the beach. Thank you for sharing your home with us!! What an incredibly, relaxing and fun two weeks in your amazing island home! Thanks you! Absolutely wonderful family vacation! 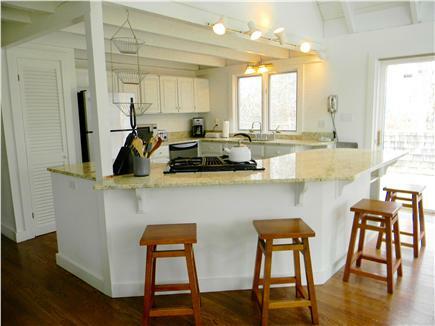 We love your home, and, such a great location! Thanks you! Probably the best weather week yet. Just Perfect! Beach, beach and more beach - enjoyed preparing dinners in the kitchen, and sitting around the table talking. Another fabulous time on the Vineyard. We adore your fabulous home and all the well thought out amenities. We look forward to summer 2018 here again, thank you! What a week in your fantastic house! We really enjoyed this house and the location. Thank you! The sound of roaring waves, laughter of children, and the breezes in the trees. . . the stuff memories are made of. Thanks for the memories!! Love this house! Great time as always, thank you! We had a wonderful vacation in your beautiful home. 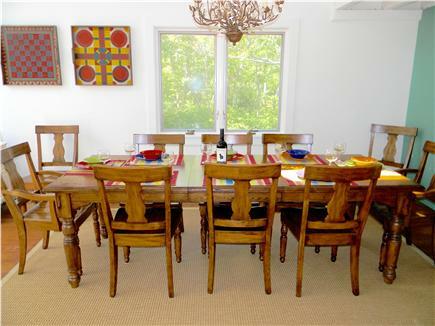 We usually rent in Vineyard Haven. This area is so much more peaceful and bike-friendly. We hope to rent again in the future. Thanks again!